rising temperatures and more or less the same times. this higher level could not be caused by humans. this, how do we know it will not cause more cooling in the future? not fall at some time in the future. (and hence temperatures) are a waste of money, e.g. So factor that in to anything he comes up with related to climate. He always presents as fact that man is doing this and that to the climate even though it’s still highly contentious. I think the faultless, inescapable and devastating logic of this simple argument utterly destroys alarmism and, if not actually disproving the theory of man-made global warming, does bring it into very considerable doubt. In conjunction with the wealth of research which also seriously questions so many of the central tenets of CAGW theory, global warming alarmism should, by all rights, be virtually dead – a zombie science. The fact that it is not is testament to the huge funds diverted to keeping it alive in our academic institutions and the huge vested interests still residing in the spin-off renewables sector, propped up by a pervasive political and social ideology which is profoundly misanthropic and anti-industrial. Well, yes. You don’t really need to ask why the BBC and Ian Stewart chose o show us bits of this temperature plot at a time rather than the whole thing at once do you? Nice bit of detective work at the crime scene there Jeremy! I love the way Ian Stewart, having present archaeological and geological evidence it was a least 2C warmer in 3000BC and had cooled and warm since then, says later in the program it is important to get rid of fossil fuels as this time CO2 was causing the warming. This time it’s different – where have I heard that before. And every time it was! Possibly Ian Stewart has had his brains addled or possibly he realises he won’t be fronting BBC documentaries no more if he doesnt toe the party line. I feel the media carry a huge part of the blame as any ‘debate’ about climate change usually involves people from FOE, Greeanpeace or worse Natalie Benett which precludes any discussion of actual facts. I would like to hear more from UKIP on this too. Nigel Farage made some comments on wind farms whilst he was in Clacton, but fairly muted. Whoops. The guide book says worsened…. becoming cooler and wetter. Please correct. Of course, if you were to argue this case with any reasonably scientifically literate CAGW advocate, the first thing they would say is ‘But this is only evidence of regional climate change, not global’, conveniently forgetting that there is abundant scientific evidence showing that the LIA and MWP in particular were globally synchronous. It’s not unreasonable to suppose that such was also the case with the Holocene Maximum. 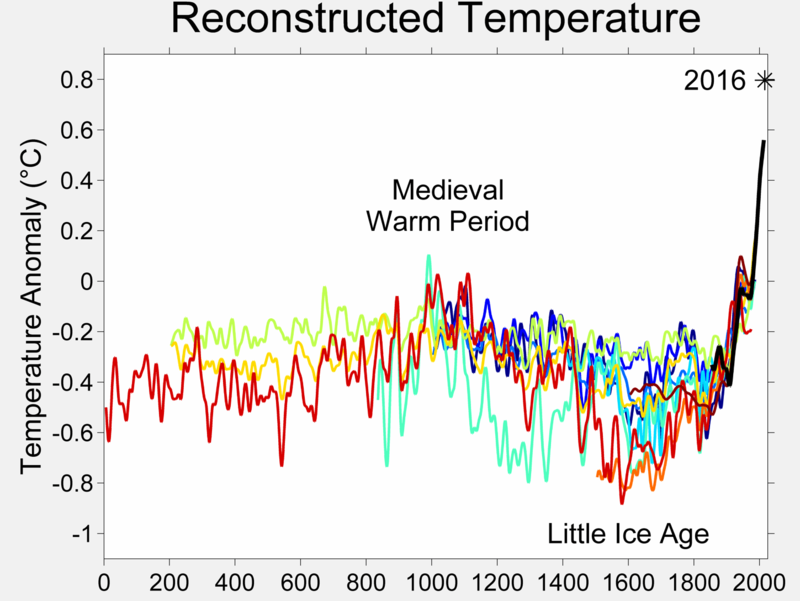 Climate fluctuations (measurably proportionate to, or significantly greater than the modern warming) throughout the Holocene are a huge inconvenience to these people who rely upon such terminology as ‘unprecedented’ and cook up hockey stick graphs of temperature reconstructions to prove their point. Hence the current trend to rewrite geological history by scrapping the Holocene and renaming it as the Anthropocene. One can see how desirable such an initiative would be – any climatic events occurring within the Anthropocene would be assumed to be not entirely ‘natural’, hence they would just become part of the all-encompassing narrative of ‘climate change’ (TM). Holocene Deniers, every last one of them. Phil the news of Skara Brae being warmer in 3000BC hasn’t reached everyone, which is strange if there is sign saying this. Prof Alice Roberts Prehistory episode of Digging For Britain featured a segment in Orkneys where she waffled on about how inhabitants had to live such harsh conditions. Does anyone have a link to a chart of the average daily temperatures for the entire Holocene? Comment stuck in moderation. Can’t imagine why. [reply] it’s the D word! 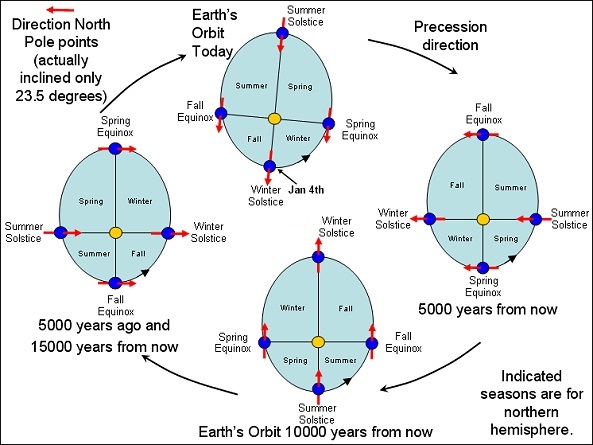 things may have been different 5000 years ago, including apsidal precession. did they all have the same cause? did they each have a different cause? 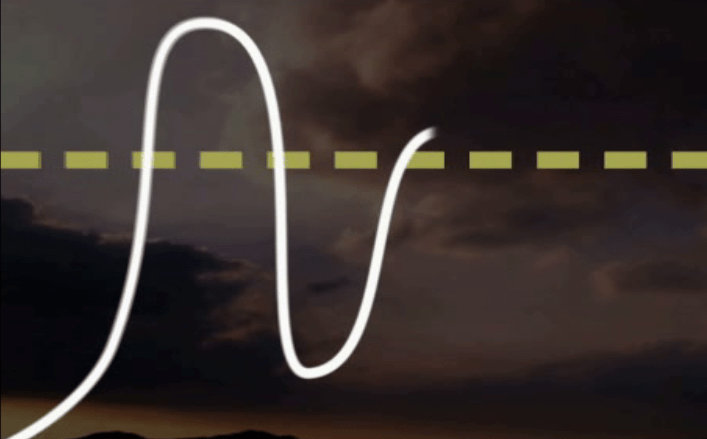 are there many different effects which combine in different ways at different times to produce a similar effect? this time it’s different because it’s co2?? should we just abandon observations in favour of the models? Single graphs don’t necessarily answer all questions, that’s all. The tilt of the Earth is considered to have some effect on regional climates. I don’t claim to know what effect it had 5000 years ago in the Orkneys, compared to today. Ah, yes, I did wonder about that when 2nd try failed too. Thanks. 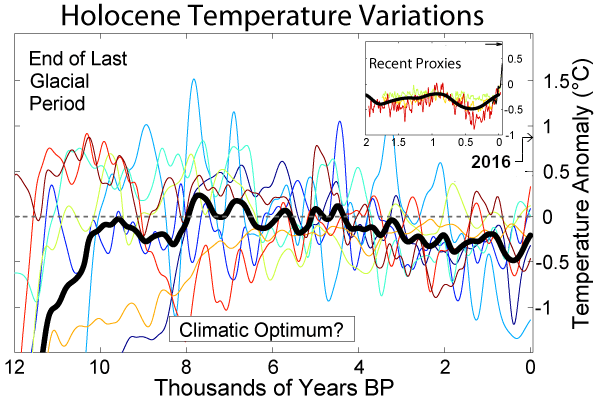 ‘The Holocene Climate Optimum (HCO) was a warm period during roughly the interval 9,000 to 5,000 years B.P. This event has also been known by many other names, including: Hypsithermal, Altithermal, Climatic Optimum, Holocene Optimum, Holocene Thermal Maximum, and Holocene Megathermal. Meaning, you can’t legitimately compare the very high resolution instrumental record with smoothed proxies and claim that this shows current warming is ‘unprecedented’. 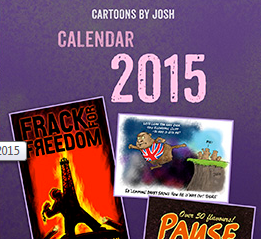 The UK seems hell bent on “Mitigating CO2 Emissions” in drastic fashion by 2050. Given that CO2 does not drive temperature there will be no measurable effect on the climate. All that will be achieved is the ruin of what is left of the UK’s industrial economy, rapidly rising electricity costs and instabilty of the power grid (blackouts and brownouts). Far away in sunny Florida I am cheering you on. If you bravely implement the grand plan, the energy disaster that ensues will ensure we won’t be tempted to follow your lead “Back to the Past” when windmills made sense.